In some semiconductors the conduction band has more than one minimum. This results in a region of negative differential conductivity, and a device operated in this region is unstable. The current pulsates at microwave frequencies, and the device, a Gunn diode, may be used as a microwave power source. The contact potential between the two materials in a diode creates a potential barrier which tends to keep electrons on the n side of the junction and holes on the p side. When the p side is made positive with respect to the n side by an applied field, the barrier height is lowered and the diode is forward biased. Majority electrons from the n side may flow easily to the p side, and majority holes from the p side may flow easily to the n side. When the p side is made negative, the barrier height is increased and the diode is reverse-biased. Then, only a small leakage current flows: Minority electrons from the p side flow into the n side, and minority holes from the n side flow into the p side. The current-voltage characteristic of a typical diode is shown in the illustration. Rectifying diodes can be made in a variety of sizes, and much practical use can be made of the fact that such a diode allows current to flow in essentially one direction only. a two-electrode electronic device based on a semiconductor crystal. The term is applied to various devices that have different principles of operation and different uses. Semiconductor diodes are classified according to the general classification system for semiconductor devices. The most widespread class is that of electric-conversion semiconductor diodes, which includes rectifier diodes, pulse diodes, voltage-stabilizing diodes, and microwave diodes such as video detectors, mixer diodes, parametric diodes, amplifier diodes, oscillator diodes, multiplier diodes, and switching diodes. Examples of optical electronic semiconductor diodes are photo-diodes, light-emitting diodes, and semiconductor lasers. The most numerous semiconductor diodes are those whose operation is based on the properties of a p-n junction. If a forward voltage, or forward bias, is applied to a p-n junction diode (Figure 1)—that is, if a positive potential is supplied to the p- region of the junction—the potential barrier at the junction is lowered, and there begins an intensive injection of holes from the p-region into the n-region and of electrons from the n-region into the p-region. 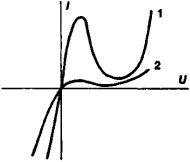 A high forward current results (Figure 2). In the case of a reverse bias, where the voltage is applied in the reverse direction, the potential barrier is raised, and only a very small reverse current of minority carriers flows across the p-n junction. Figure 3 shows the equivalent circuit for such a semiconductor diode. The operation of rectifier power diodes is based on a pronounced asymmetry of the volt-ampere characteristic. Semiconductor diodes for rectifying devices and for other high-current circuits are manufactured for permissible rectified currents Ir of up to 300 amperes (A) and for maximum permissible reverse voltages U*rev from 20–30 volts (V) to 1–2 kilovolts (kV). Semiconductor diodes for similar applications in low-current circuits have an Ir of less than 0.1 A and are called general-purpose diodes. At voltages greater than U*rev. the current rises drastically, and an irreversible (thermal) breakdown of the p-n junction occurs that results in the breakdown of the diode. In order to increase U*rev to several tens of kV, rectifier stacks are used. In such a stack, several identical rectifying semiconductor diodes are connected in series and are mounted in a common plastic casing. The time lag exhibited by rectifier diodes depends on the lifetime of the injected holes, which is greater than 10-5-10-4 sec. This time lag limits the frequency range within which semiconductor diodes can be used to, usually, 50 to 2,000 hertz. The use of special techniques—primarily the doping of germanium and silicon with gold—has permitted a reduction in the switching time to 10-7—10–10 sec and the construction of fast-acting pulsed semiconductor diodes. Such diodes, as well as diode matrices, are used mostly in the low-current signal circuits of electronic computers. Figure 3. Small-signal (for low signal levels) equivalent circuit of a semiconductor diode with a p-n junction: (rp-n) nonlinear resistance of the p-n junction; (rb) bulk resistance of the semiconductor (diode base); (rleak) surface-leakage resistance; (CB) barrier capacitance of the p-n junction; (Cdif) diffusion capacitance, which is caused by the accumulation of mobile charges in the base when a forward voltage is applied; (Co) casing capacitance; (Lr) inductance of contact conductors; (A) and (B) terminals. The solid lines show the connections of elements that are part of the p-n junction proper. If the breakdown voltages are low, there usually occurs not a thermal breakdown but a reversible avalanche breakdown of the p-n junction, that is, an abrupt increase of current at an almost constant voltage called the stabilization voltage Ust. The operation of semiconductor voltage-stabilizing diodes is based on this kind of breakdown. General-purpose voltage-stabilizing diodes with a Ust from 3–5 V to 100–150 V are used predominantly in regulators and limiters of constant and pulsed voltages. Precision voltage-stabilizing diodes can be provided with compensating elements to achieve exceptionally high temperature stability of USt, (up to 1 × 10-5-5 × 10-6 per degree Kelvin). Such voltage-stabilizing diodes are used as sources of reference voltages. 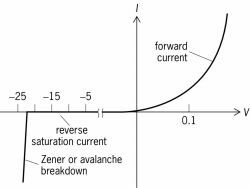 The reverse current of a diode is subject to considerable fluctuations in the prebreakdown region. This property of the p-n junction is made use of to construct noise generators. The time lag during the development of an avalanche breakdown in a p-n junction is 10-9-10–10 sec. It leads to a phase shift between the current and the voltage in the diode and thus can cause the generation of ultrahigh-frequency oscillations if the diode is connected to an appropriately designed electric circuit. This property has been successfully made use of in avalanche transit time diodes, which have permitted the construction of oscillators with frequencies up to 150 gigahertz. Mixer diodes and video detectors are used for the detection and conversion of electric signals in the microwave region. In most of these devices the p-n junction is formed under a point contact. 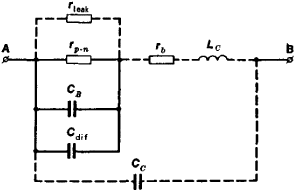 This design provides a low value of the capacitance CB (Figure 3). Also, as in all microwave diodes, structural features that are specific to each type provide low values of the parasitic inductance Lc and capacitance Cc and permit the diode to be installed in wave-guide systems. 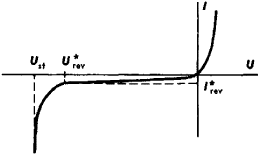 When a reverse bias not exceeding U*rev is applied to the p-n junction, the junction behaves as a high-Q capacitor, whose capacitance CB depends on the magnitude of the applied voltage. This property is made use of in varicaps, which are used primarily for electronic tuning of the resonant frequency of oscillatory circuits; in parametric semiconductor diodes, which are used to amplify microwave oscillations; and in varactors and multiplier diodes, which are used to multiply the frequency of oscillations in the microwave range. In such diodes efforts are made to reduce the magnitude of the resistance rb (the basic source of active energy losses) and to increase the dependence of the capacitance CB on the voltage Urev. differ substantially from the volt-ampere characteristics of other semiconductor diodes. The differences include the existence of a region of negative conductivity, which is strongly pronounced in the case of the tunnel diode, and high conductivity at zero voltage. Diode thyristors, that is, semiconductor devices with two terminals and an uncontrolled four-layer p-n-p-n structure, are also classified as semiconductor diodes. Another type of semiconductor diode is the Gunn diode, which makes use of the volume effect of domain instability in semiconductor structures without a p-n junction. Two other semiconductor structures used in diodes are metal-semiconductor contact, which is the basis for the Schottky diode, and the p-i-n structure. The characteristics of these structures are in many regards similar to those of a p-n junction. The p-i-n-structure has the property of changing its characteristics when irradiated. This property is made use of, in particular, in photodiodes and nuclear radiation detectors. These devices are constructed in such a way that the photons or nuclear particles can be absorbed in the crystal’s active region, which is immediately adjacent to the p-n junction, and can change the magnitude of the reverse current of the junction. Light-emitting diodes make use of the effect of radiative recombination of electrons and holes: because of this effect, certain p-n junctions exhibit luminescence when a forward current passes through them. Semiconductor lasers can also be classified as semiconductor diodes. Most semiconductor diodes are fabricated through the use of planar and epitaxial techniques, which permit the simultaneous production of up to several thousand semiconductor diodes. Si is the chief semiconductor used in semiconductor diodes, but such materials as Ge, GaAs, and GaP are also used. Au, Al, Sn, Ni, and Cu are used as contact materials. The crystal of a semiconductor diode is usually protected by packaging within a metal-glass, metal-ceramic, glass, or plastic casing. In the USSR, semiconductor diodes are identified by a six-character code. The first two characters are letters: the first denotes the semiconductor being used, and the second letter indicates the class of the diode. Three digits follow that show the number of the type. The sixth character is a letter that identifies the group of the diode. For example, GD402A is a germanium general-purpose diode, and KS196B is a silicon voltage-stabilizing diode. Semiconductor diodes are superior to their electron-tube analogs—such as kenotrons, gas-discharge voltage stabilizing tubes, and gas-discharge indicators—in that they have considerably greater reliability, a longer service life, smaller size, better technical characteristics, and lower cost. For these reasons, semiconductor diodes are supplanting electron-tube devices in most areas of application. The development of semiconductor electronics has brought about a transition to the production not only of discrete semiconductor diodes but also of diode structures in monolithic integrated circuits and of functional devices where the semiconductor diode is an inseparable part of the device’s structure. Poluprovodnikovye diody: Parametry: Metody izmerenii. Moscow, 1968. Fedotov, la. A., Osnovy fiziki poluprovodnikovykh priborov. Moscow, 1970. Also known as crystal diode; crystal rectifier; diode. A two-electrode semiconductor device that utilizes the rectifying properties of a pn junction or a point contact. More generally, any two-terminal electronic device that utilizes the properties of the semiconductor from which it is constructed. The wall plug efficiency of the semiconductor diode lasers used in this type of system is the largest contributor to overall system wall plug efficiency, and improving the efficiency of the semiconductor diode laser will greatly increase the possible output power and reliability of these laser systems. The Apex 800 (formerly called the IRIDERM 810) is a 600 Watt, solid-state laser based upon 800 nm semiconductor diode lasers. begins with telephone and wireless communication systems and GPS, then continues to radar systems, radio frequency propagation, RF noise and link analysis, modulation techniques, RF amplifiers, oscillators, frequency multipliers, mixers, modulators, demodulators, and block diagrams, advancing to RF components and circuits such as transmission lines and devices, waveguides, antennas, lumped constant components, transformer devices, piezoelectric and ferrimagnetic devices, acoustic devices, semiconductor diodes, bipolar and field-effect transistors, and high- power vacuum tubes. The book will cover the two most important applications of semiconductor diodes - solar cells and LEDs - together with quantitative coverage of the physics of the PN junction at the senior undergraduate level. Industry segments analyzed in the report include: 'Semiconductors and related devices, Semiconductor diodes and rectifiers, Light emitting diodes, Integrated circuits semiconductor networks etc. Semiconductor and Electronics Industries in the Philippines, Inc.